Mythology and art have gone hand in hand for millennia. One of the greatest thrills for lovers of art is to decipher, interpret and expand the meaning of an image from the symbols and story contained within. Some artists like Hieronymous Bosch and Peter Bruegel bombard the viewer with symbols and demonstrative caricatures by the dozen - others are more subtle. Another aspect of mythology that gives it an enduring appeal is its exploration of prevalent themes about base human passions - which are equally relevant today as when they were inscribed on a clay tablet or carefully inked onto a scroll many centuries ago. Helen of Troy, also known as Helen of Sparta is one of the most famous women in history. Stated to be the most beautiful (mortal) woman in the world she became entangled an affair of the heart which had significant repercussions - the destruction of the famed city of Troy. This is what the mythology states, and whilst Historians and Archaeologists toil away to uncover the truths behind the myths - the stories of the myths themselves are often just as intriguing to explore. In this case - what is interesting that something as simple as an apple could be at the centre of such fuss. 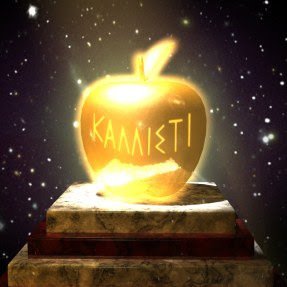 The apple itself seems to be at the heart of many fantastic events(mythical or not)... the Garden of Eden, Norse Mythology, Newton's germinating thoughts about gravity, or even the tale of William Tell. The apple had its intended effect, and a disagreement broke out between Hera(Bride of Zeus), Athena(Zeus' warrior daughter) and Aphrodite - also a child of Zeus and the famous Goddess of beauty and love. Each of these women contested that the apple was theirs. Not wanting to get involved, Zeus decreed that young Trojan Prince, Paris would settle the dispute. It was at this point that poor Paris, and Troy was doomed. Descending to the mortal world accompanied by Hermes, the heavenly ladies confronted him whilst herding cattle and demanded he chose the most beautiful of them. Each attempted to bribe him, Hera offered ownership of the known world, Athena a warrior's prowess. It was Aphrodite however that won that day, offering the love of the most beautiful woman in the the world of man, Helen of Sparta. She sealed the deal by dropping her robe and displaying herself to Paris. 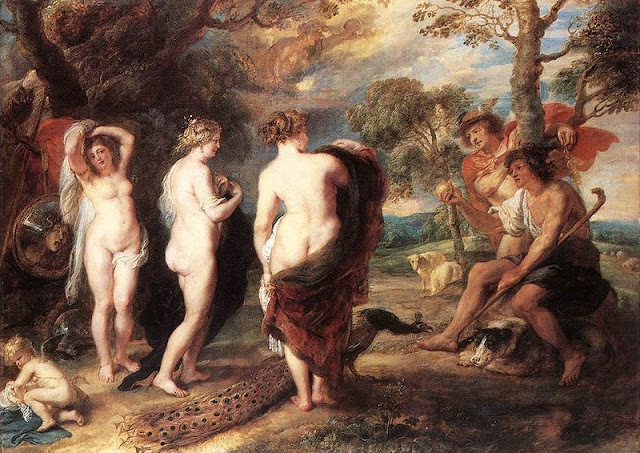 Peter Paul Rubens depicts this famous scene splendidly in his Judgement of Paris (pictured above), believed to be painted in 1636 and currently on display at the National Gallery, London. In this context, the apple being a symbol of lust and temptation (as it is in Scripture) is quite plainly stated. It would be interesting to find out at what point in their literary evolution these tales met. Perhaps they evolved separately? Mythology has shown a peristent tradition of being related to the mythic traditions of other cultures - the great flood from the Old Testamen and the Epic of Gilgames, the life story of Jesus Christ and its similarities to that of Egyptian God Horus and Indian God Krishna and just a few examples of the plagiaristic nature of antiquity. Paris' subsequent elopement with Helen was stated as one of the key causes of the Trojan War. Helen's beauty was so renowned that her face is described as one that 'launched a thousand ships' as The Greeks attacked Troy, to plunder its wealth, and steal Helen back. In actuality, the plundering would have been a more likely motive for such a massive military undertaking - but no good story is without some romantic melodrama. 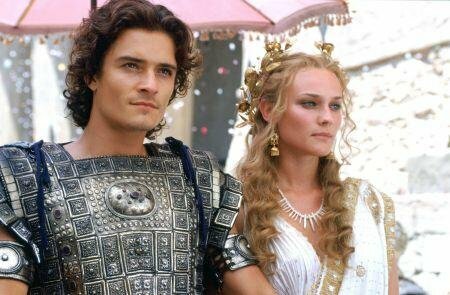 The Hollywood rendition of this famous love story as depicted in Wolfgang Petersen's 2004 Epic Troy, featuring an all star cast including Brad Pitt as Achilles, Eric Bana as Hector and Peter O'Toole as King Priam. Orlando Bloom makes a good 'pretty boy' Paris. I'm not as sure about Diane Kruger as Helen..... I would have gone for a more Mediterranean looking actress myself. The advent of computer generated effects made depicting the 'thousand ships' a matter of digital cut 'n' paste. 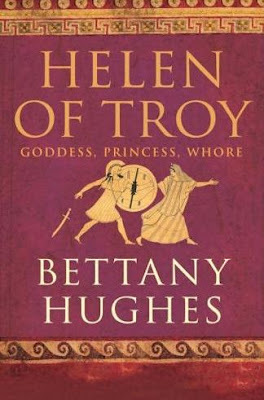 The documentary is a wonderful visual accompaniment to Bettany Hughes' biography of Helen, also released in 2005 - Helen of Troy - Goddess, Princess, Whore. Hughes' writing style is as engaging as her TV presence. It's an easy read for History fans of any degree.